It’s the most wonderful time of the year and that means everything peppermint and chocolate! Last week I made my favorite Secret Ingredient Peppermint Chocolate Mousse and my craving for the combination has not let up since. But don’t worry, I didn’t have to go long without it. 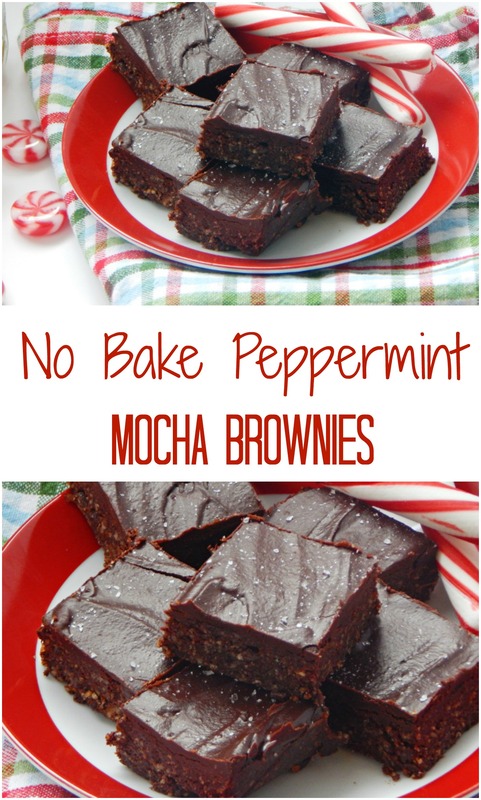 I whipped up these No Bake Peppermint Mocha Brownies in no time. I added a rich, gooey fudge icing layer to make these even more ridiculously delicious. The icing is totally optional, but it definitely takes these brownies up a notch. 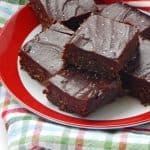 I typically use pecans as the base for these no bake brownies as I feel they break down easily and the oils release quickly so the brownies are much more moist than with other nuts. You could soak them or the dates for a bit as well for a smoother texture. 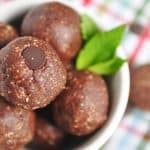 I tried these also with half oats/oat flour and half pecans as well but I found that they were a bit more dry and so more dates were needed in the end. If you don’t want to use all nuts as the base, just add several more dates and that should help. 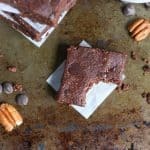 These brownies are ready in a matter of minutes and they will taste just like the happy holiday that is here. If you are tired of waiting in line for your favorite holiday coffee drink, these will satisfy the craving but without all of the sugar and artificial flavors! In a food processor, process pecans until very fine. Add chocolate chips and process for about 10-15 seconds more. Press very firmly into a parchment lined pan (I used a pyrex 6x8). Allow to chill for about 10-15 minutes. While brownies are chilling, whisk together all ingredients for the icing together until smooth. Spread icing over the brownies until covered and return to the refrigerator. Allow to chill for at least another 10-15 minutes before serving. 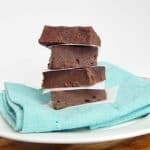 Allow brownies to sit out for about 5-10 minutes before cutting.